Dr. Corene Hurt-Thaut received her master’s in music therapy, and her PhD with an interdisciplinary focus of music, neuroscience and statistical design, from Colorado State University. 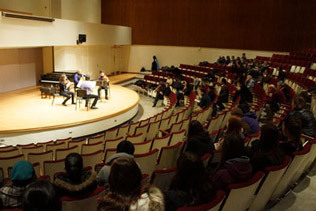 She served as a special assistant professor of music therapy from 1997-2014, teaching classes in piano technique, music therapy methods and counseling for psychiatric populations, music therapy methods in neuro-rehabilitation, research in music therapy, advanced techniques in neurologic rehabilitation, and seminars in neurologic music therapy. She was a research associate at The Center for Biomedical Research in Music at Colorado State University from 1997-2015, and the director of the international training programs of The Academy for Neurologic Music Therapy since 1999. She is nationally and internationally recognized for her clinical expertise in the evidence based practice of Neurologic Music Therapy, with clinical experience including 3.5 years as a music therapist at Wesley Woods Geriatric Hospital and the Center for Rehabilitation Medicine at Emory University Medical School in Atlanta and 4 years as a Neurologic Music Therapist at Poudre Valley Hospital and The Center for Neurologic Rehabilitation in Fort Collins, Colorado. Her work has included a diverse range of clinical populations including: stroke, Parkinson’s disease, traumatic brain injury, cerebral palsy, multiple sclerosis, Alzheimer’s disease, autism, and psychiatric disorders. She served on the exam committee for the National Certification Board for Music Therapy (CBMT) as both a member and Committee Chair from 2001-2006, and as an elected member of the CBMT National Board of Directors from 2009-2013. She has also served as President and Vice-President of the Midwestern Region of American Music Therapy Association. Dr. Hurt-Thaut has numerous research publications in the area of music and motor control as well as ten book chapters highlighting specific applications of neurologic music therapy to her credit.